Gary has been around bees all his life. His dad caught a swarm in 1945, a year before Gary was born, and kept bees from then on, first in Pictou then later, and for the rest of his life, in Kentville. Gary helped his dad from about age 7 on and into his teens, but didn't start keeping his own hives until he was an adult and living and working as a teacher in the Shubenacadie area. What got Gary hooked was working on the Atlantic Winter Fair in the early 70's. Forty years later he was still a stalwart supporter of the fair ... the go-to-guy, gathering up samples and display items, ferrying them to the fairground, setting up the display, helping man it , and often taking it down on the last day. The NSBA always tried to have two beekeepers at a time on duty at the booth, and more than one "newbie" has commented on the fun and learning they had when paired with Gary, as he seemed to have an instinct for how to hook both kids and adults, and ancient mariner-like, fix them with his steely eye and excite and entertain them with tales of bees and the hive. When Gary bought his own place in Shubenacadie in 1975 he got a couple of hives of bees and experienced one of those miracle years, harvesting a 600 pound crop. At that time many Nova Scotia beekeepers were package beekeepers who gassed off their bees in the fall with cyanide and started again in the spring with bees from the southern USA. Gary successfully wintered and subsequently split his two hives and started gradually working up his hive numbers to max at the 100-120 level that he could manage as a sideline while teaching school. Gary joined the NSBA executive in 1983 and was president in 1985 when the USA border was closed to bee importations because of tracheal mites. The package bee era was over. It was "the end of an industry" the media trumpeted. As president of the NSBA Gary polled Nova Scotia beekeepers to determine their views. Most of them favoured the border closure. Interestingly, many western beekeepers of the time, who were much more dependant on package bees and a "use 'em and gas 'em" approach to beekeeping, wanted the border kept open despite the disease issue. Thirty year later –as reported elsewhere in this newsletter- the issue is still alive, controversial and divisive. 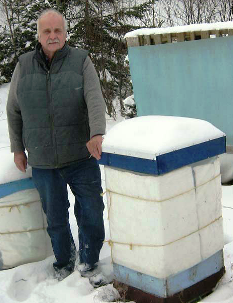 In response to the border closure, and in his role as NSBA president, Gary helped provincial apiarist Lorne Crozier develop a program to strengthen beekeeping in Nova Scotia. The program was rolled out after his term was up. It involved subsidies for beekeepers to buy packages from disease free sources (Australia and New Zealand) and assistance in buying woodenware and foundation. Many beekeepers benefitted from this program and upped their numbers and some became commercial because of this leg up. Gary took over his father's bee business in 1996. The honey house is in the backyard of the home in Kentville where his mother still lives. Gary winters some bees in the Kentville area, but he also keeps them in around Shubenacadie and the Musquodoboit Valley where most of his blueberry pollination customers are located. Yards located in apple orchards give his over-wintered hives a jump start for blueberry pollination. The common wisdom is that making splits and nucs significantly reduces your honey crop, but Gary disputes that belief. He recalls one year making 46 nucs and still having a decent honey crop. Gary always moves his nucs or splits from the parent yard and leaves them queenless for 20-24 hours before introducing a queen. The introduction involves spritzing the bees and the queen cage with dilute sugar syrup flavoured with a little vanilla extract. Gary says his success at queen introductions is about 95% using his method. He often leaves a loose grass plug in the entrance to reduce movement in the new unit and removes it if the bees have failed to do so when he checks for queen release. He thinks making nucs stimulates the bees to make more bees, and he is careful to help them out with insulated covers, enough bees to avoid chilled brood, tight equipment, division board feeders positioned next to clusters, and five frame boxes that he supers with five frame boxes so the bees can build upwards and still have the tight quarters that they prefer for heat retention. Gary winters his nucs in two five frame boxes. Each nuc has an upper entrance. He puts two rows of five nucs back to back. He places them on rigid foam insulation, tops them with an insulated common cover, puts foam slabs on the ends and wraps the whole block. Gary's "anno horriblis" was the winter of 2009-2010. A medical diagnosis called for eye surgery and trips to Toronto. As a consequence he took honey off late and treated late, and unsuccessfully, for varroa mites. He is still re-building from the heavy losses of that winter. We are all learning that modern beekeeping is quite unforgiving. Gary packages and markets most of his own honey in standard 500 gram, 1 and 2 kg formats. His creamed honey is quite famous and other beekeepers sometimes ask him to cream and package honey for them. His procedure is a trade secret, just like Caramilk and the Colonel's special sauce. "Don't ask me how I do it," he said. He also produces comb honey and does small jars for samples and gift baskets. The beeswax by-product of his extraction is used by his sister Nancy Maxner. She developed Naturally Nancy's hand cream to cure her own cracked hands and the product has proven very successful. Creamed honey excepted, Gary has always been willing to share and help promote beekeeping. He stocks and maintains observation hives at the Shubenacadie Wildlife Park and the Museum of Natural History in Halifax. He has spoken to would-be farmers about beekeeping at Department of Agriculture sponsored events, done many school visits, been an annual contributor to my winter introductory beekeeping course and has helped many newbies get started. Tom Cosman- "I Am going To Do That!"